Where is FF8? Is Square Enix planning to do a full remake of FF8 after FF7? The legacy Final Fantasy series comes to additional platforms. 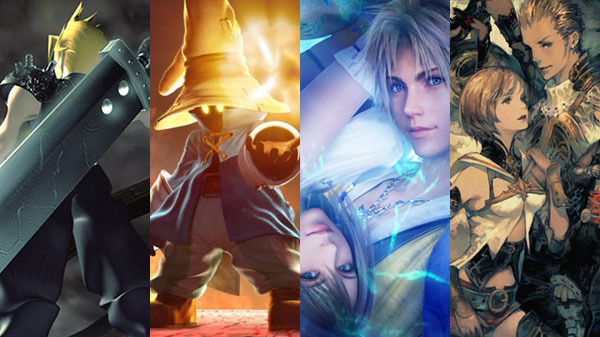 Final Fantasy VII, Final Fantasy IX, Final Fantasy X | X-2 HD Remaster, and Final Fantasy XII: The Zodiac Age are coming to Xbox One and Switch in 2019, Square Enix announced. All four titles are currently available for PlayStation 4. The game that not only revolutionized the way in which videogames are both created and talked about, but also what they can represent. Final Fantasy VII changed the face of gaming back when originally released, going on to inspire an entire generation of Final Fantasy fans. We’re bringing the original Final Fantasy VII to both Nintendo Switch and Xbox One! AVALANCHE was secretly formed to wage a rebellion against Shinra Company, an organisation which is absorbing Mako energy, destroying the natural resources of the planet. Cloud, a former member of Shinra’s elite combat force, SOLDIER, was involved with the bombing of the Mako Reactor. Final Fantasy IX tells a grand story of love, war and betrayal. Final Fantasy X absolutely lit up the sixth generation of consoles with stunning production values, including gorgeous graphics, a stunning soundtrack and a moving story. Final Fantasy XII: The Zodiac Age improves upon the 2006 classic Final Fantasy XII, now more beautiful and easier to play than ever. The high-definition remaster introduces several modern advancements, including reconstructed battle design and a revamped job system. With newly implemented modern advancements, as well as stark visual and sound improvements in true HD for the first time, players both returning and new to the game will experience a grand adventure that spans the world of Ivalice in an entirely fresh and improved way. Enter an era of war within the world of Ivalice. The small kingdom of Dalmasca, conquered by the Archadian Empire, is left in ruin and uncertainty. Princess Ashe, the one and only heir to the throne, devotes herself to the resistance to liberate her country. Vaan, a young man who lost his family in the war, dreams of flying freely in the skies. In a fight for freedom and fallen royalty, join these unlikely allies and their companions as they embark on a heroic adventure to free their homeland. I hope they don't. I always thought that FF VI deserved a remake way more that VII. It's funny to see the hypocrisy of people when they criticized the vita for having nothing but ports and then this happens. Hopefully they don't waste any time or resources on 8. I'm with Hagane. A remake of VI is what they should be doing. retail cart and make it a collection or no deal! But I know they will just be digital only and separate at high prices. Blah! If they indeed plan to remake 8, then the system better be completely revamped/redesigned. There's still no good explanation why 8 is missing. FFVIII wasn't included because it was awful. Yeah I agree. I remember that I figured out how to get Squall's last gunblade before the end of the second disc and it pretty much broke the game because he becomes very overpowered. FF8 hasn't been ported to PC recently. 7 and 9 are the remasters recently released for PC, mobile and PS4. With that said, yes FF8 was a stinker for the time, but compared with the stinkers 13 and 15, it smells like flowers. Till this day i remember the moment that killed FF8 for me, when they were in a basketball field and all remembered they used to live together but didn't say anything. Mind you these are 16-19 years old. No, i couldn't buy it. It broke my imersion there and then for the rest of the game. I couldn't take it seriously anymore.